Happy Independance Day? Living Liberty? 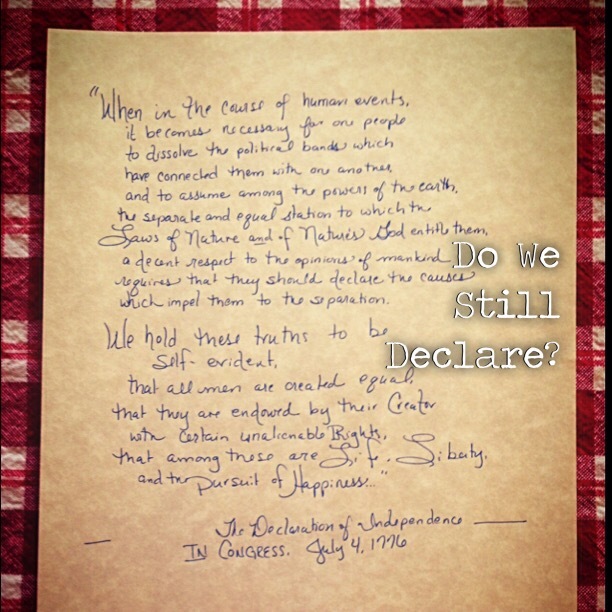 The original portion of this was written July 4, 2016… what about today – post Election 2016 ? How are we handling history & our own citizenry? In what ways do we find our homes pulsing “life, liberty & pursuit of happiness?” How about our communities at large? How are we modeling for our students & each other our history matters even as we desire to press for better? In the wake of losing Elie Wiesel this past weekend, we may need to pause to consider if we’re either capable or committed to remembering history enough to properly respond to his loss, to this holiday, and adequately resume tomorrow with a thriving Hope we forgot that was handed down to us. Do we celebrate? Do we cynically party-on … dawning red, white, and blue today only to complain about The Donald, The Hilary, the empty movements parading around tomorrow? Do we know the terms? We’re handed a baton to pass on to future generations. Are we humble enough to take responsibility for our wrongs? Are we, Citizens, generous enough to share, encourage, and plan without government mandates? And courageous enough to Gracefully live on? In our day, are we more apt to declare dependence on our government instead of rising to the occasion and acting as humble, responsible citizens? Remembering: The shining weight of Liberty assumed responsibility & respect… and humility. Are we actually becoming more self-centered, less civilized? When we refuse to look back & thank our forefathers for their forebearence for us, will we adequately look ahead and principally forebear for future generations? A worthy pause & ponder today… Are we really living &preserving Liberty? Do we still declare? Honestly, I still hear rumblings of complaints & commands … but, change won’t come that way. Just more complaints & commands. What our forefathers knew that we too easily forget is that civil discourse, philosophy & reason matter. What we think, how think, & how we communicate to one another matters. Whining & complaining is epidemic. From sporting events to social media, is it not embarrassing? How are we communicating our commonalities & our differences? We can rise above this polarizing poison if we pause long enough to remember the process of our forefathers moving from pilgrims to patriots to passing us the Constitution… how will we live more honorably in the present that we may model & have something honorable for our children to pass on to their children? Is it only whiny words? Or perhaps, wise living … that they offered us in declaring independence, securing liberty, AND establishing a framework for the preservation of an honorable people united by principles instead of royal or peasantry bloodline or anything else in between.